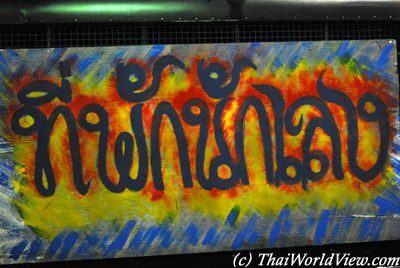 As the seasonal monsoon rains descend over Thailand, it marks the beginning of the Buddhist Lent, during which all Buddhist monks retreat to the temples. This is also an auspicious time for Buddhist ordinations as it marks a period of spiritual renewal. A night fair is happening during the wax candle procession period. Games such as balloons shooting are available. The Buddhist Lent is a time devoted to study and meditation. Buddhist monks remain within the temple grounds and do not venture out for a period of three months starting from the first day of the waning moon of the eighth lunar month to the fifteenth day of the waxing moon of the eleventh lunar month. 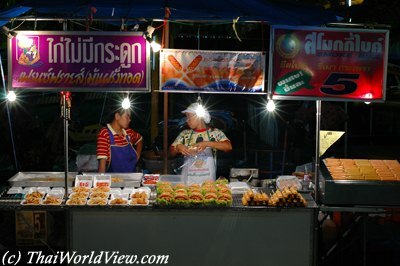 Delicious Thai food and snacks are available during the night fair. In former times, this is done to prevent monks from trampling upon rice paddies when they venture out to receive offerings from the villagers. Villagers actively engage in merit-making during the Buddhist Lent, visiting temples to make offerings of food and items for daily use. The presentation of items that provide light, such as candles, lanterns and lamp oil, is deemed to be particularly important as these facilitate the study of holy scriptures and meditation by providing illumination to the monks, physically and spiritually. 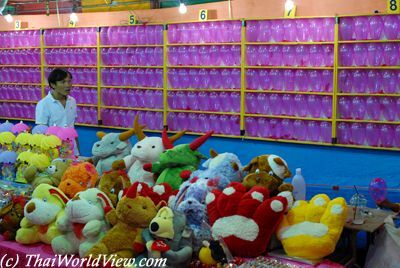 A night fair is happening during the wax candle procession period. 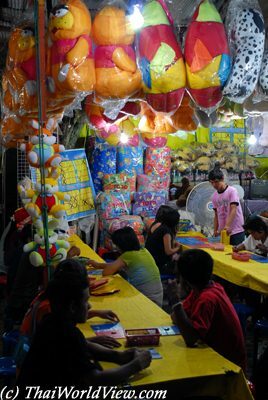 Games such as lotto are available. 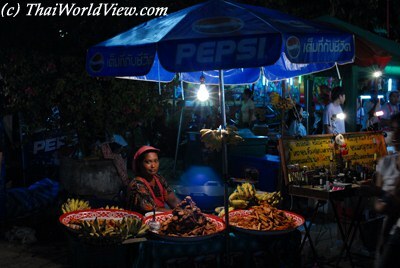 Buddhism, Buddhist traditions and beliefs are central forces that shape the local way of life. Various festivals of religious origin have been observed for generations and have evolved into full-scale festivals featured in the Buddhist calendar. A night fair is happening during the wax candle procession period. 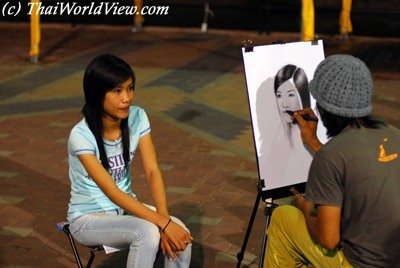 Activities such as portrait drawing are available. 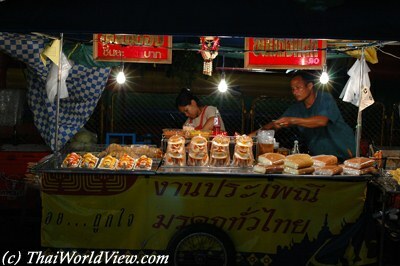 Delicious Thai food and snacks are available during the night fair. This lady is selling banana crackers. 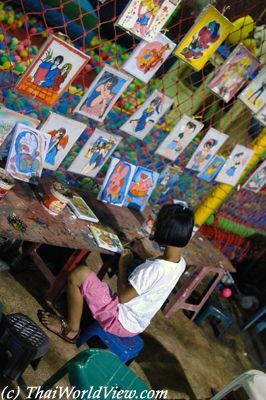 Children can colorize drawings with different paintings or even sand. Police is present during the night fair and a specific lorry is here to keep the bad boys.